We are excited to share with you the children our Redeemer's Friend family has sponsered. These children now have hope to education, identity, and a life-giving community. Sabrinah is a 9 year old who loves to have fun. She is enthusiastic about playing the games that teacher creates to help teach the kids and she loves singing songs. She is sort of mentored by the 2 eldest girls and is learning to help around in the classroom more. We are very curious and excited to see the ways that Sabrinah will grow both spiritually and intellectually. Sabrinah's family background is unclear to us right now as we are still trying to connect with her parent (s). We do know that she lives among the other children in some of the poorest conditions and that she benefits from our program. Your support will allow us to continue to invest in her and share the love of Christ in a tangible way- one that will have life-time effects. This is Mahandry. He is a 4 year old boy that, like any 4 year old, has a difficult time focusing in a classroom of mixed ages. Thankfully we are able to feed him breakfast, snack, and lunch daily, as well as teach him the basics of coloring, counting, and whatever else his young mind can fixate on. Since the beginning of our program, he has warmed up to the staff a lot. He loves playing ball and we encourage that to get all of his pent up energy out. He is a little fighter, so we are currently trying to teach him how to deal with his frustration in a kinder way. He and his brother Fanatenana come from a single-parent home where the mother is struggling to provide for her 2 children, as all of the parents are. Mahandry has been sponsored since August by Parris and has since learned a little bit of reading and writing and a whole lot of Jesus. We are thankful for Parris' sponsorship and are excited to connect them further and help build their relatinship. This is Sidonie, also known as Christinah. She is a lovable 3 year old who cannot sit still for more than 3 minutes. She is often found running around in circles, giggling, and holding on tightly to either the staff or the teacher. She loves to cuddle and se loves to be tickled. Sidonie comes from a single-parent home. her dad died awhile ago and so she just lives with her mom and her sister, Erika, who is also in our program. Sidonie is too young to truly grasp everything that is taught but the teacher works to create separate lessons for her and the other little kids so to match their abilities. Sidonie has been sponsored since October by Bruce and Anita and we are so thankful for God's provision in her life. We look forward to seeing her growth and connecting her sponsors with more opportunities to build a relationship with them. This is Jessica. She is a 6 year old who often goes under the radar because she doesn't talk much nor is she a fighter like her classmates, but you can be sure that there is always a smile on her face. Whenever we want to find Jessica, all we need to do is look past the pile of wrestlers in front of us, to find a sweet little girl sitting nicely against the wall and laughing. If you saw the conditions that this sweet child lives in, you would tear up. Dirty water from a lake where people also use the restroom, is what they use to clean the dishes in her house. Food is scarce, for her, as it is for the rest of the kids. We have actually never met Jessica's parent(s) and are looking forward to connecting with them to further understand her context. This is Stephane. He is a wild little 4 year old who is always laughing. His favorite thing to do is to play ball and sing songs. His best friend is Mahandry, who is also in our program. Like most 4 year olds, Stephane has a hard time sharing, so the biggest lesson that we are trying to teach him (outside of who Christ is) is how to include his friends when they are playing. Stephane lives in a single-parent home and although, they work hard to provide, by selling old scraps that they found in the trash, making enough money to buy food is difficult. Stephane has been sponsored since September by Nataly. We are so thankful for God's provision and look forward to updating her on his growth and connecting the two of them to develop a relationship. His name means hope. He is 7 years old. What we love about him is that he is always playing eye tag. We often look over at him to find him looking away and giggling. He's a very sweet boy and loves resting his little head on someone's shoulder. His brother is Mahandry, another child in our program. He is shy but very able to complete the assignments that the teacher presents. Fanatenana and his brother come from a single-parent home, the mom struggling to provide for the two of them. Your support for Fanatenana and his brother provide the materials needed to attend school and the food needed to nourish their bodies and keep their focus. Fanatenana has been sponsored since August by Parris! We thank God for His provision and look forward to continuing to help the two of them build a friendship. Erika is an 8 year old girl who is the sister of another child in our program and comes from a single-mom family. Because of poverty, her mom often engages in drinking alcohol and chewing tobacco, and the latter one has actually become an issue for Erika herself. This is something that we are working on and recognize as a symptom of not having enough affection in the home. We are not only working with Erika to help change behavioral patterns but also are in discussion with the mother about to get her the coping mechanisms that she needs to change some things at home as well. Erika is probably what people would call the "class clown". She is constantly joking and pranking to get a reaction out of her classmates. She is hilarious and lovable and very intelligent. She hasn't quite adjusted to the structure of the classroom, but we have hope for her that once we can help her behaviorally, she will thrive. Your support brings her the ability to attend a loving, Christ-centered school that would allow for her gain the community and education needed to thrive. She will not only have a happy stomach but a happy heart. Alfred is the oldest in the program. He has never been to school before and so he is learning how to read and write along with everyone else in the classroom who are much younger than him. He takes an older brother approach and usually helps keep the little ones in order. The teacher gave all of the older kids classroom responsibilities and Alfred happily does his chores every day. Because he is the oldest, he is also the most disciplined. Right now, we are trying to figure out the best way to help him since he should be in high school but has never had the opportunity to go to school before. He needs to learn that basics with the other kids before he can move up. We are still trying to figure out Alfred's familial situation. We are not quite sure who he lives with since we have never met his family, but we know that he lives in the same slum situation that the other kids live in. 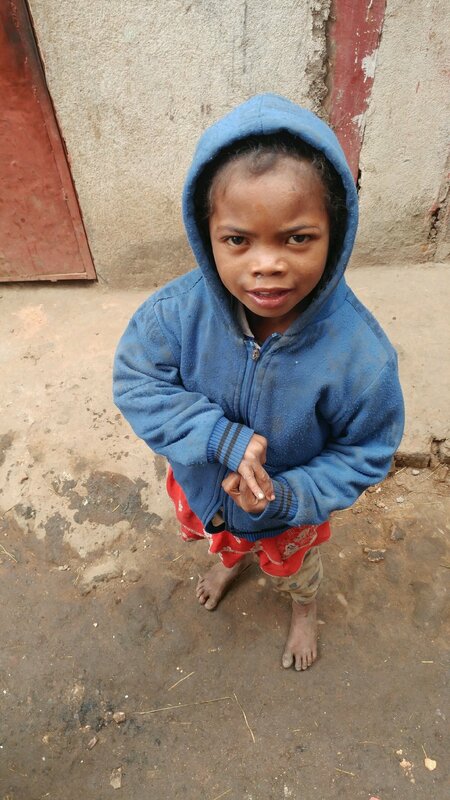 We are currently looking for opportunities for Alfred to be able to leave our school and go to a public school in Madagascar that would allow him to take the necessary tests to be able to get a high school diploma. We will be in search of resources and other people that would be able to assist him in catching him up to high school level. Regardless of where he attends school, Alfred would still be able to be fed daily, provided school supplies and clothing, and have access to any resources that we have available. Avotra does not attend our Redeemer's Friend school because he lives to far from us. Instead, we were able to connect him and his brother with the director of another school and make an agreement that if we provide the uniform and his school supplies, that he would be able to go to school for free! Supporting Avotra looks a bit different than supporting the kids at our school. We support his family as a whole by providing rice and charcoal, as well as beans and corn to their family to last the whole month. Your support would enable us to continue that. Your support would also assist us in making sure that Avotra continues to have the school supplies that he needs and the medical care to attend school. Avotra is a bright boy. He is silly and fun and eager to learn. We asked him if he was excited to go back to school and he said that he was ready! We look forward to seeing how he excels in school and grows in faith. Federic is a 10 year old boy best known for his smile. You will always see him with a happy face regardless of what is happening at home. He isnt rowdy like the other kids, but when he does break a rule or 2 (which doesn't happen often), all we need to d is look at him and he bursts into giggles. He is sweet and gentle and so happy to be a part of our program and be able to have a full belly. Federic is one of our older kids and as a staff, we are assessing his academic level and trying to determine our next steps for him and lead him on a path that would best grant him success. It may be the case that we need to find him another school that provides the tests and the structure that the government requires for a diploma. Regardless of where he is learning, food, clothing, and materials will always be given to him, as he would still be a part of our program. Supporting Federic helps us do that. Nambintsoa is a 7 year old whose family background we are not sure of. What we do know is know is that when he first entered our program, we saw the effects of poverty in the form of a wound on his foot. There was a big gash on his foot due to an accident that had been stitched back together with a line of dirty wire. Obviously this brought him a lot of pain. Along with the other children, we are hoping to connect him to medical care soon, so that we can make sure that his foot is healing well and that his body is functioning as it should. Nambintsoa is discouraged and frightened by any discipline. He first joined the program as very shy little boy and has since warmed up and made friends, but we are continuously working to make him feel safe in the classroom and to learn that when he is disciplined that he is still loved. Join us in helping continue to provide for him and show him the love of Christ in a tangible way. Lilliane is a bright and very disciplined 10 year old who has been set in charge of keeping the class in order. She is often the teacher's helper and has gained the respect and obedience of the younger classmates. She is smart and has been working hard to understand the material that teacher gives, but we can tell that we need to push her more to see what she is really capable of. Doris is a young 9 year old in our school who is silly and fun and upbeat. He is always giggling and playing a joke on the kids or the teacher. Doris can be found running around in the classroom, doing silly things to make his classmates laugh. Doris is a curious boy, drawn to the things that he learns in class, but has been slow to learn them. He is still getting the hang of being in a structured class setting. We are not sure yet what Doris' home situation is like. We are still in the process of getting to know his family, but what we do know is that he lives in the same shacks that his classmates do and that food is scarce. Supporting Doris is giving him the tools and nutrition that he needs to succeed. Finoana is one of the youngest little girls in our group, as she is only 3 years old. To be honest, in terms of learning actually how to read and write, she isn't there yet, but we have at least been able teach her about who Jesus is and try to guide her toward Christ. She is sweet and obedient and very easy. Out of all of her classmates, she is the least likely to get into trouble as she doesn't usually really engage much with rowdy behavior. She is calm and is usually found sitting still in a corner with a smile on her face. She is a joy to be around. We are still investigating her family background considering that Finoana always comes to class alone and we have never had the chance to interact with her mother. We do know that her home is one of the shacks that line the green lake, where all of our kids live. She has clothes that need to be replaced, a tummy that needs to fed, and a heart that needs Jesus. We are thankful that she came to us at such a young age and look forward to seeing how your support will help her flourish! Sandra is referred to as "Sandra 1" in our classroom because there are two little girls with the same name. She is 7 years old and is constantly looking for a way to climb into the laps of one of the staff and cuddle with them. She, at the beginning of our program, struggled with school, but is learning more and more every day. She is often distracted by the constant movement of her classmates and joins in, but she is sweet and lovable. She comes from a single-parent home (like most of our kids) and struggles to be able to eat daily. Our program gives her access to food, education, and the ability to learn and about the constant love and affection of Christ. Supporting her would allow us to continue to demonstrate God's love in a very tangible way.